The CMM-11E1 is a low cost, entry level development package. Development is quick and easy with the on board EEPROM, the optional DB9 cable and DOS based bootloader. The optional UTL11 disk contains Manuals, the Small C11 compiler and the S19 files for the Buffalo monitor. The on board EEPROM comes configured with the Buffalo Monitor. Basic 11 is not recommended for this board. For application code write code on a PC and using the menu driven bootloader, follow the simple bootload instruction, download, reset and run. No prom burner or special voltages required. Your code is safe and secure in nonvolatile memory. 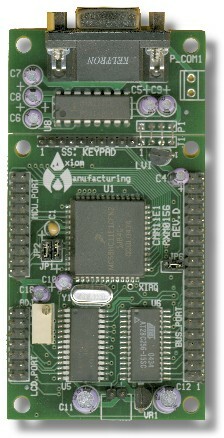 Board Size 2.0 x 3.75 w/o RS232 2.0" x 2.75"